Why do Westies need a Rescue? There are many reasons why Westies end up being given up by their owners. Like many dogs of all breeds and types, many are bought as pups without proper consideration being given to the huge commitment that owning a dog involves. After a while, the dog becomes a strain and burden, and the owner feels that their dog would be better off in another home. In other cases, the Westie is a victim of his cute good looks! Underneath that cute exterior lies a dog who was originally breed to work, specifically to kill rats and other vermin. As a result, they tend to be tenacious, self-willed, fearless, cocky, and stubborn. They are certainly not lapdogs. This strength of character takes many new owners by surprise, and the problems that ensue as a result of clashes of opinion between dog and owner result in the dog having to go. Despite what you may have been told, Westies are not suitable as family pets where there are young children. That tenacious character does not blend well with children. As a general rule, Westies are not particularly fond of being picked up and cuddled, they have a tendency to be intolerant, they tend not to like feeling that they are cornered or trapped, and they tend to be rather quick-tempered. None of these traits mixes well with young children. To make matters worse, if a child does not realise the Westie is unhappy about what the child is doing, the Westie is a lot quicker than other, milder-mannered breeds, to bite. And for this reason, many Westies end up being put to sleep or rehomed because they’ve had a disagreement with a child. We do not recommend the Westie as a suitable pet for families with children under 10 years of age. We live in a busy world where more and more people have to work full time to pay the bills. This entails a significant increase in the amount of time they’re away from home on a daily basis. Sometimes, an owner gets promoted, or has to emigrate, or move to non-dog-friendly accommodation. Sometimes, an owner becomes ill or incapacitated, or saddest of all, dies. In all of these cases, their dog is losing his home through no fault of his own. They are usually very well cared-for dogs who are used to living a happy, family life. In all these cases, the owners are trying to do the best for the dog. It is important to look at the world from the dog’s perspective: if the owner feels that they are not giving the dog everything he needs to live a full and happy life, then they are doing the right thing by letting him go, with the protection of Westie Rescue, to a new and loving home. We take quite a few Westies from dog pounds, where they have been seized by the dog wardens as strays, or even surrendered into the pound by their owner. Such Westies are in a lot of trouble, because stray dogs in Irish pounds have only 5 days to be reclaimed before being put to sleep, or rehomed. Surrendered dogs get no extra time. We need to move very quickly to get these Westies out and into safety. We rescue and rehome an average of sixty Westies every year. That’s a lot of dogs, but it is only a proportion of the Westies who are rehomed via other channels, or put to sleep, every year. Why are there so many Westies being rehomed every year? It’s a simple matter of over-production. 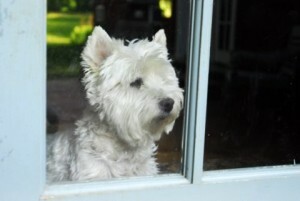 Westies are a very popular breed, which has invariably encouraged a lot of people to breed them. Unfortunately, many of these people are only interested in making money: they are not interested or knowledgeable about lines, genetics, behaviour, health. Westies are one of the most common breeds you’ll find being produced on Ireland’s “puppy farms”. These are establishments in which dogs are mass-produced, often in horrific conditions, for the pet dog market. Such pups often end up for sale through dealers, pet-shops, or on free-ads websites and newspapers. Other breeders decide to make a few quid by breeding their pet dog, or breeding from a smaller number of dogs, literally in the back yard. Such breeders are often called “back yard breeders”. Mass-production and indiscriminate breeding of Westies by puppy-farmers and back-yard breeders has resulted in more and more Westies with skin problems, hip deformities, bone deformities, problematical digestion, and behavioural problems, including aggression and phobias. Pups bred by puppy-farmers and back-yard breeders tend to be raised in severely impoverished environments, and they do not get the vitally important early socialisation they need before they are sold on to new homes. This tends to have disastrous consequences for new owners, because their new pups know nothing of living in a house, living with children, being handled, or even going to the toilet away from their bed. Although a mass-produced pup might seem a cheaper purchase, in reality their poor health and questionable behaviour result in high vet and training fees, not to mention the awful emotional price to be paid for trying to manage a pup that is sick or behaviourally impaired. Read Sonny’s Story for a sad example of a pup bought from an uncaring breeder.